Ok, so I know it’s not quite time to start clearing your desk, walls and student belongings, but getting an early start on your end of the year classroom clean-up is imperative! It makes life so much simpler. You’ll be more organized, productive and frankly happier for taking these steps early on. You’ll definitely thank yourself later for this step. I used to pull up old pictures of my classroom when I was stumped on how to set up a specific section for the new school year. This is really helpful because sometimes you either want to avoid or follow specific patterns and designs. Try this out, you wont regret it. 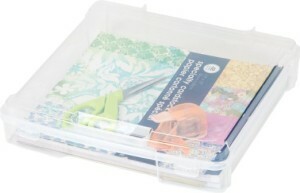 Use stackable bins to store all of your important materials. 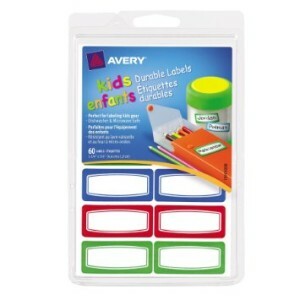 Store all like materials in one bin, with labels that are clear and easy to read. 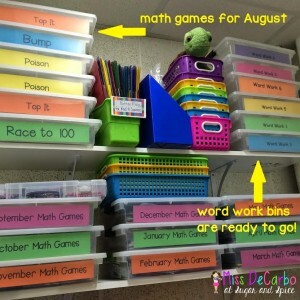 You can color code your labels for more efficient organizing (ex. math=blue). Also, while you’re storing your class items, it is super important to toss out anything that isn’t useful. 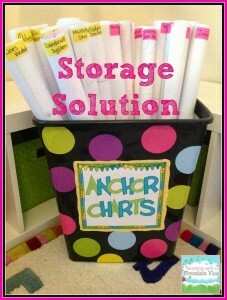 As teacher’s we can really accumulate a lot of “treasures”, but you don’t want to become an educational hoarder :D.
Use sleek bins like these to utilize as much storage space as possible. Creating a checklist will only help to optimize all your tasks. 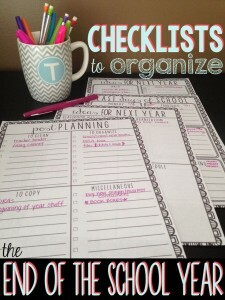 In the free printable checklist below you can create checklists planning for next year as well as the last days of school. It’s also helpful to create an inventory list of everything you have, so that you can appropriately gather materials over the summer. 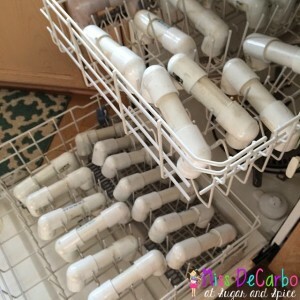 As you’re stacking, storing, sending home and purging be sure to clean whatever you can. 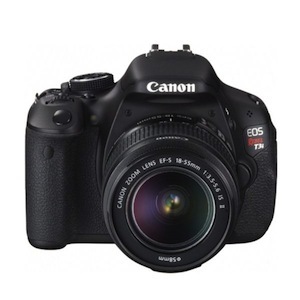 This will help in maintaining the condition of your items. You’ll be surprised about the dust accumulation and smudged fingerprints that can occur in such a busy classroom. It’s also helpful to involve student volunteers in this task. 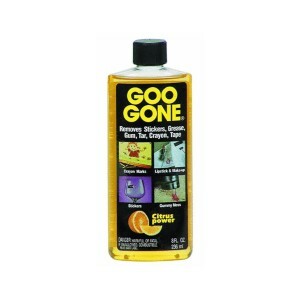 Such a helpful solution for all gooey/sticky surfaces (from either stickers, tape, glue or anything else). Create one bin that has all of your essentials in it. This basically refers to all the items you’ll need right away when setting up your classroom (for example: scissors, stapler, tape, pens/markers, etc). If you do this right, then you wont need to unpack unnecessary items just to get to your essentials. 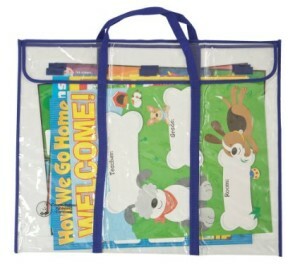 I absolutely love using the clear bulletin board/poster storage case displayed below. It kept my posters and bulletins in a water proof case, while keeping them safe and preserving their condition. It’s a great investment. Alternatively you can roll up your anchor charts, but be sure to label them to avoid constantly unrolling them to see which is which. 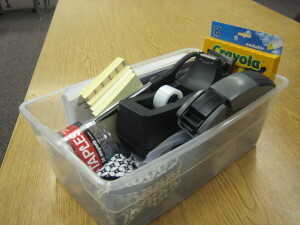 Bulletin board storage case. This is sleek and easy to store (I kept mine in a crack between my desk and the wall). 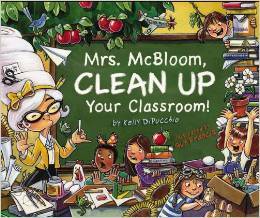 Let your students know that you’re beginning to tidy up the classroom as the end of the year approaches. Chances are they’ll race to offer their help.